We may not have the Maytag repair guy, but we've got the next best thing. My 15 year old washing machine has had a very bad vibration since she was off loaded from the sea container. Sometimes she actually walked across the utility room during the spin cycle. Then last week, she started filling, and filling, and filling, and wouldn't ever stop to wash a load of clothes. Not good! 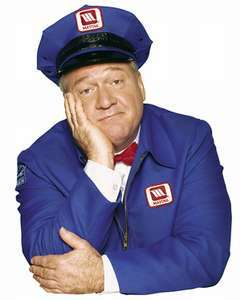 Here the "Maytag Man" doesn't come to you. You have to load up you appliance and take it in for repairs. Lucky for us Rodolfo was here fixing and changing a couple of things for us around the Casa, so he was able to load the washer into his pickup and take it into Taller Los Angeles, here in Atenas (that not TALLER as in a tall person, it's tie-yair as in a shop). The guys at Taller Los Angeles can fix just about any household appliance, or small motor, you can think of. Everything from toasters and blenders, to refrigerators and washing machines. We have used them on multiple occasions and quality of their work is second to none. I explained the problems with the washer. They said they would check it out and it should be ready in a few days. I called the Taller today and they said the patient was ready to be picked up and she is working fine again. So, this afternoon we went to the Taller to pay for the repairs and bring her home. The technician that worked on her said he fixed the overfilling problem and tested all the fill levels to make sure it's filling properly and going through the complete wash cycles. He also found the problem with the vibration, greased the tub springs and adjust the leveling feet. One foot had striped out, so he re-threaded it. Total cost ¢20,000, or $40 USD. Now our only problem was how to get the washer back home again. Here we have whats known as a Cargo Taxi. It's actually a taxi pickup truck. I gave them a call and 5 minutes later the washer was loaded into the bed of the pickup and headed home. The fare for the Cargo Taxi, which included loading and unloading, was ¢2,000, or $4 USD. We reconnected everything and just finished washing a test load of towels. This baby didn't sound this good when she was new. The vibration during the spin cycle is totally gone, and Ms. Maytag will probably last me several more years. Oh happy day when we can again wash....I really mean that! Thanks again for the wonderful day at the Waterfall Gardens and lunch. Keep in touch. Do you have a Facebook page? I had to come home early. My very dear friend died Saturday night and I was/am so sad. So I am home again.